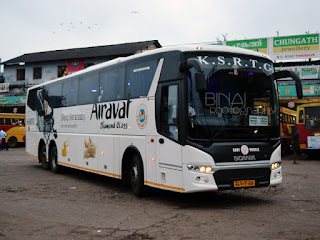 After moving all Kerala bound buses to the Satellite bus station on Mysore Road, here is the next move: Move all Tamil Nadu bound buses (except the premium Airavat Volvo, of course!) to Shantinagar BMTC Bus station. As a prelude to the move, all KSRTC Rajahamasa buses to Kerala/Tamilnadu added Shantinagar as a pick up point. 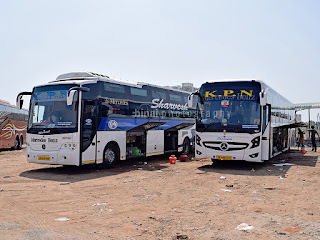 Services to Kerala via Mysore now start from Shanti Nagar and then go via Mysore Road Satellite bus station, while service to Kerala via Hosur start at Mysore road and go via Shanti Nagar. 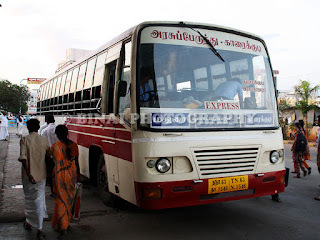 I'd welcome the move which is benefit quite some passengers who find it easier to reach Shanti nagar compared to MCTC. The bus station, however, is not big enough to hold on buses for a long time. Ideally, these buses will have to be parked outside the bus station (it appears that a vacant plot right next to the bus station has been cleared and some sort of construction was being done there) and they should enter the bus terminus only at the time of departure. As an initial move, KSRTC has opened a ticket counter (a reservation counter) at the bus station, and staff are posted there to assist passengers to find out their bus. The news of the shifting has been confirmed by newspaper reports (The Hindu dated 14 October 2008). For others, make it convenient to come to Shantinagar (or MCTC) to get into your buses, or hold on to private operators who continue operating from Kalasipalayam & Madivala. Which PF's at Shantinagar are they (KSRTC) using? Also, what about the BMTC buses passing thro' Shantinagar? What PF's are they using now? These buses would operate from the same platform as that of the KSRTC run buses to Anekal/Hosur. I am not sure what it is numbered. SETC buses will also start from there. It has been confirmed in The Hindu. From Marathahalli, you can take a bus to Richmond Circle. At Richmond circle, you can change a bus to reach Shanti Nagar. Otherwise, take a bus to HSR layout and change over to a bus heading to Majestic/KR Market from there. They would drop you at Shantinagar. 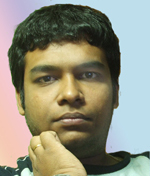 From where can i get the details of bus timings online. whats s d timing of d bus to kannur frm thr.....??? n may i hv to book it b4?? ?